Elio Motors unveils 84 MPG 3-wheeler, but can they deliver? Startup carmaker Elio Motors has unveiled their prototype 3-wheeler at an event in Michigan. The car claims 84 mpg highway and safety standards equivalent to most compact cars. Are they better than all of the other failed 3-wheel automakers who've come before them? 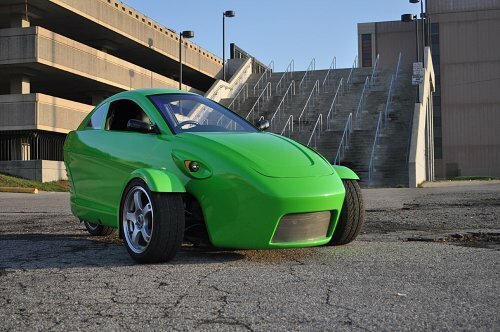 At a press conference in Michigan, Elio Motors showcased their 3-wheeled prototype, a second iteration of the Elio. A large part of the press event was to introduce the suppliers for the car, which they plan to take to production in the spring of 2014. The Elio is powered by a 3-cylinder, 1-liter, 70 horsepower fuel-injected, single overhead cam (SOHC) gasoline engine. This mates with a five-speed manual or automatic transmission (manual is standard) and will achieve a projected efficiency of 49 mpg in the city and 84 mpg on the highway. Much of the press conference detailed how Elio has been progressing over the past two years to bring the car to fruition. Most of this work has been to coalesce suppliers and achieve a goal of 95 percent American-sourced content. Their approach to design has been to hold monthly "supplier summits" where supplier representatives and Elio designers came together to talk about how the car could be built using existing or easily-modified parts already on the market. This approach is unusual in the industry, as usually the suppliers are given orders as to what the carmaker wants and then left to figure out how to supply it. This comes from the other side, approaching them with basic specifications and then modifying the design to fit with the best part option (already existing on the supplier's shelf). This has resulted in the Elio having a price tag of a projected $6,800 when it ships next year. As another interesting addition, the Elio will go through safety testing and is expected to achieve a 5-star rating, despite safety testing not being required of a 3-wheeled vehicle (considered a motorcycle by federal rules). The car includes a Safety Management System with three airbags, a reinforced rollcage frame, Anti-Lock brakes, and fifty percent larger crush zones than its counterparts. If the company can raise sufficient funds through pre-orders and investments, they will build the car in Shreveport, Louisiana at a former General Motors plant. This fundraising (in the tens of millions) will be the most difficult part of Elio's next few months. Although the headquarters for Elio is in Louisiana, the press conference was held in Michigan because most of the company's suppliers are based there. The Elio has three big things going for it compared to other 3-wheelers which have recently come and gone, failing to gain investment or sales. First - the car is a standard gasoline vehicle using proven, known, easily-sourced technology that is both prolific and cheap. Electric enthusiasts may lament the fact that Elio did not go with an EV powertrain, but by going gasoline, Elio avoids the need to explain their powerplant to people and greatly expands their market well beyond the limited EV markets. With a range of 650+ miles per 8-gallon tank, the Elio is a fit for far more drivers than a 100-mile electric would be. Second - the car will have a price tag inside the ATV/golf cart range, making it affordable to nearly every person in the U.S. The low price point and expected 5-star crash test rating would mean that insurance will also be very cheap. The 3-year, 36,000 warranty will be a big bonus and Elio's plan to market the car to lower-income people by using a simplified credit plan (through one of their partners); the Elio will not just be a great price point, but will be affordable all the way around from purchase to operation. Third - American-sourced, American-made. If the Elio is produced in numbers, it will be one of the most American-made vehicles on the road. Far more so than nearly every car made in Detroit. This may be a big selling point as it fits in with Elio's overall branding strategy, which is to promote the idea that the car itself is the end product of an ecosystem of American know how and labor. One of the driving ideals behind Elio is to source the car domestically, sell it to both rich and poor domestically, and build a new paradigm for automotive domestically. Knowing all of that, however, there are obviously downsides. Here are three things working against Elio. First - investment to start a new automaker, especially one wanting to get rolling within a year, is not easy to come by. Tesla Motors, the only startup automaker so far to produce vehicles in quantity and still be here to do so, took far longer than that to develop the Roadster (which wasn't fully produced by Tesla) and then the Model S. After years in business, the company just began turning a profit. On the other hand, Tesla is an electric car maker and their vehicles are premium priced whereas Elio is neither of those. Second - while 3-wheeled cars are cool, they aren't very mainstream and so selling them may be a tougher row to hoe than a standard sedan would be. On the up side to this, 3-wheelers also don't have all of the bureaucratic red tape, vastly simplifying the product-to-market requirements. Still, the Elio being a tadpole will mean fewer sales in the long run. Third - marketing is almost non-existent. So far, the Elio has received little relative publicity and no marketing at all. This may seem preliminary, but anyone who's run a business knows that having a product is great, but if you don't have marketing to push it, even the greatest product in the world will fail. Marketing is the reason Nicola Tesla is not as prominent in gradeschool history books as Thomas Edison is. Edison made a big impact not because he was better, but because he had better marketing. Elio has little marketing. I learned about it entirely by accident. So far as I know, they have not issued any press releases to any major PR outlets. Of these three things, the third is probably the one that will kill Elio if anything does. With marketing comes investment and sales. So the first two could be alleviated if the third were remedied. As it is, at best Elio will be a niche vehicle with slow sales until either the company invests heavily in marketing or it closes its doors. On the other hand, I have pledged to put my money where my mouth is. If the company begins marketing in earnest and appears to be able to begin production next year as they plan, I will plunk down the deposit on an Elio myself. I like the concept and even sight unseen, the car is awesome. I love the lime green and orange colors (they have others, don't worry) and I know from experience that 3-wheelers are a blast to drive. So I'm on board to buy one should they seem to be actually going to market. As it is, though, I remain unconvinced that they will.